Can disgust be a key component of horror? The feeling of disgust is often used in horrors, exspecially visual medias (where is arguably easier to shock the audience with great effect). Often horror stories revolve around one scary element (a villain; a monster; a disease) that carries along a lot of repulsive traits. The alien in Alien is slimey and it drools a lot; the ambience in Silent hill movies and games presents often narrow corridors, covered in filth; in Stephen King's Insomnia the protagonist has to explore the crampled, dirty nest of the main antagonist, and so on. Disgusting elements often leverage our natural instinct; e.g. I remembered reading that seeing internal organs up close evokes repulsion since evolution has thaught us that it's not good if those things get out of your body. This said, is disgust - rather than fear - enough to be used in an horror story? Probably some genres of horror have a higher component of repulsive elements (I'm thinking of body horror), but my question holds. As a component of "horror" it has a role to play - and it can be quite effective. On it's own? No. Seeing internal organs up close can as you say invoke a disgust/repulsion response. But context will determine whether we are likely to have a horrified response as well. A dish in an operating theater containing say an appendix that has been removed in an appendectomy could reasonably trigger some disgust. But it's not horrifying in of itself - the organ has been removed but we know that it's likely to be as a result of a relatively routine medical procedure. Finding the same organ in a chipped bowl on the floor of a dingy bathroom spattered with blood however is likely to be both disgusting and horrifying - because we know that not only objectively is performing surgery in that sort of environment inherently more dangerous to the subject but it's also something that heavily implies it was done under some pretty worrying circumstances. Essentially disgust can be viewed as a spice - you add it to your horror scene to alter/enhance the flavor, but you can't just put a load of it on a plate and call it dinner. A significant effort in analyzing the concepts of horror, terror and sublime times back to the XIX century. From what I recall, they are connected to a sense of fright and fear, with horror being the disgust felt after a deep a profound scare. That being said, the mere sight of a slimy pond of garbage, while disgusting, may not be enough to cast a sense of horror in the onlooker. On the other hand, if an arm stretched out of the pond of garbage mentioned above, barely missing to grab a character in your story, and if the character was utterly frightened by the experience, then the sense of revulsion would be what we call horror. People want a wide gamut of emotions in their movies. Even horror movies have their moments of joy. Even children's movies have their moments of terror. There's an interesting theory which can help explain the answer, called the Lövheim cube of emotion. It is a rather untested scientific hypothesis from 2012 (read: nobody has evidence that it is accurate, and they aren't doing much testing on it), but I find it to be sufficiently useful for exploring emotions in a fictional setting. 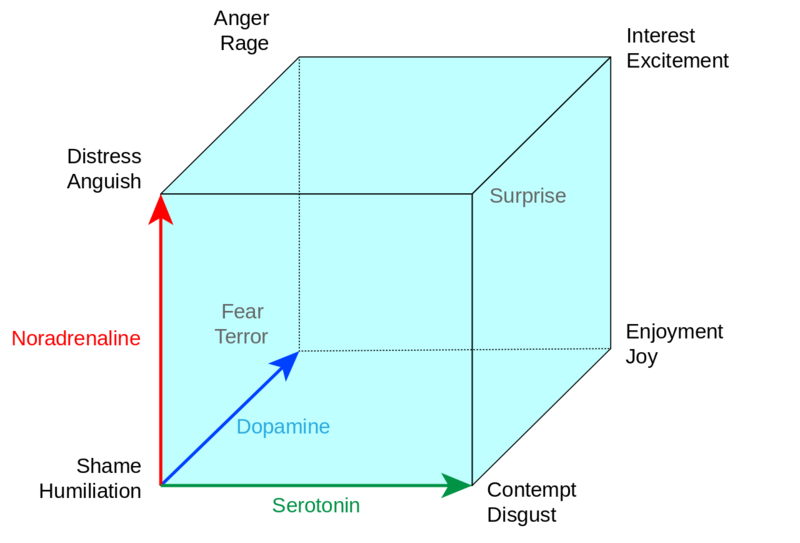 The cleverness of the cube was tying the three monoamine neurotransmitters in the brain to emotion -- particularly the 8 base emotions from affect theory. This is, of course, the untested part of the hypothesis, but it points us in useful directions. The monoamine transmitters have some very coarse behaviors that can be used. Consider these to be very approximate behaviors. Any neurologist would giggle at the oversimplification, but it suffices here for studying how movies affect us. Noradrenaline measures how unpredictable things are on the short term. A roller coaster causes a surge of noradrenaline because the path it takes is hard to predict. Dopamine measures whether there is a reward nearby. We often talk of it as being "the reward system," but its more accurately a measure of nearby value worth searching for. Dopamine is the itch for an addict that says "there's value near by... all you need to do is inject it." Seratonin roughly measures how happy the body is. When our stomach is full, seratonin is used to signal that. Now again, these are tremendously oversimplified, but we can use them to look at these base emotions and study how they relate. Consider the one in question here, disgust. This is low noradrenaline, low dopamine, and high seratonin on the cube. If I map that using those oversimplifications, we see that means that your mind sees no real reward to be had, the situation isn't really changing, but the reptillian part of the brain seems pretty happy. For many, body parts cause disgust. Practically speaking, there's no reason for the reptillian part of our brain to mind. After all, internal organs are food. But our higher brain is going "nope nope. Nothing to be gained here. Just stop looking. stop, okay? Just move on!" Consider the famous alien scenes with the slime. How do they play out? Reptile brain sees nothing wrong. The alien is just sitting there, posturing. It's not successfully evoking a flight response. But the brain gets a disguist feeling. You can't rip yourself away. Your higher order brain says "Nothing good can come of this, it's time to leave... now," but your lower brain is saying "but watch it... let's see what could happen. It's interesting." Then the alien does something sudden. This wasn't predicted, noradrenaline spikes, and you get surprised. "Oh. It has a second set of jaws. Well that wasn't expected." "Good feeling's gone." At this point, your lower brain realizes its mistake. This is not the place the inner reptile you wants to be in. Anguish ensues. Now there's a choice. If your realization of what's going on stagnates first, noradrenaline goes down. If your reading of the situation is "yep, we're screwed. yep... still screwed. Not changing... Oh why did I get myself into this mess," You shift to shame/humiliation. I do find some people get this response in horror. I know I get it from gore movies like Saw. Why did I think it was a good idea to watch this movie? * From there, there's often a chase scene, where one travels to fear/terror. There is a path out, so dopamine surges, but the badness isn't going away any time soon... still predicted. Alternativly, we see some travel straight to fear/terror. As the unpredictableness dies down, the brain starts seeing the path out. It skips shame/humiliation entirely. The key to that last point: you don't always travel along the edges. Skilled movies can take you anywhere in the cube volume. Again, this is a very oversimplified model. However, I find it effective for analyzing the rollercoaster you take a viewer on. If you decide a situation needs more anger, it suggests what you need to do (a fast changing situation where there's a chance of reward if you do something fast). Once that coarse analysis is done, then your skill as an author can look at the scene at a deeper level, and find your voice. So to that end, can disguist sell a horror movie alone? The answer is generally no. People want a wide gamut. Thats why even the most happy-go-lucky movie has some surprise or anger in it. Indeed, I find the worst movies for my taste grind me into the ground with shame/humiliation, where I feel there is no escape (particularly those where I feel that even hitting the stop button wont free me from what my mind is doing). But moving around the cube brings spice to a story. Not the answer you're looking for? Browse other questions tagged horror emotions or ask your own question. Is my serial-killer novel horror or crime? What is the structure of a paranormal horror story?